At a time when the popularity of craft beer with innovative flavours is on the rise, we’re also seeing established brewers looking to the past for inspiration. Greene King has done precisely that with its Heritage Series of beers. The recipes used to create the ‘new’ range of ales is based upon recipes used by the Suffolk-based brewer during the 19th century. 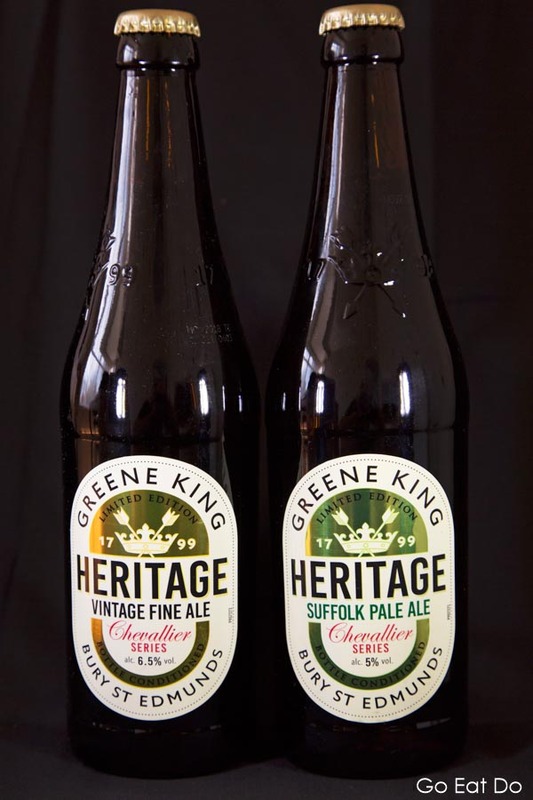 The series features two beers: the Heritage Suffolk Pale Ale which has an alcohol content of 5 per cent and the Heritage Vintage Fine Ale, whose volume consists of 6.5 per cent alcohol. Bottles of Greene King’s Heritage Series of beer. The bottle-conditioned ales are said to replicate the style of beer supped by people in Suffolk during the early 1800s. The Greene King Brewery was founded by a 19-year-old, Benjamin Greene, at Bury St Edmunds in 1799. The town lies around 26 miles north-west of Ipswich, Suffolk’s county town, and Greene’s ales would have been drank by thirsty local farm workers as well as the townspeople of Bury St Edmunds. In 1887 the brewery founded by Benjamin Greene — by that time ran by his son, Edward —amalgamated with another Bury St Edmunds-based brewery, the St Edmunds Brewery which was owned by a man named Frederick King. And there you have the origins of the name of brewery that has subsequently grown into an organisation with more than 3,000 pubs across the United Kingdom. 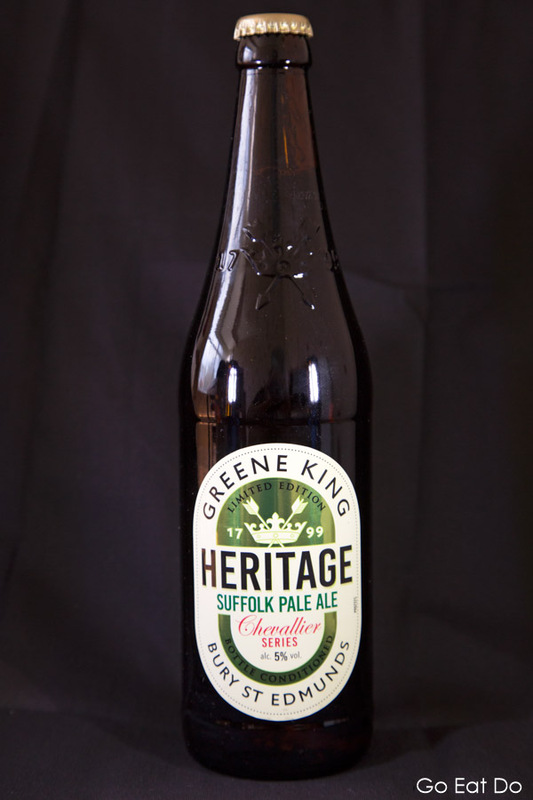 Bottle of Greene King’s Suffolk Pale Ale from its Heritage Series of beers. The labels of Greene King’s Heritage Series bear the word Chevallier. Upon seeing that term, I assumed it was the use of the French word for ‘knight’ and the heritage aspect of the beer might refer to a historical figure from England’s long-distant past. In fact, Chevallier is a type of barley that was once grown in the fields of East Anglia. Over time it fell out of production. The Crisp Malting Group revived Chavallier barley after cultivating five preserved seeds. The Vintage Fine Ale, a full-bodied beer, is brewed with Bramling Cross, Goldlings and the wonderfully named Fuggle varieties of hops. Too many of these ales, at 6.5 per cent alcohol by volume, and perhaps you could well say that anyone would be ‘fuggled’ up. But, of course, beer consumption is all about enjoying the product in moderation and enjoying the subtleties of the flavour. The Suffolk Pale Ale makes use of Strisselspalt hops, whose origin is in Alsace, and Saaz hops, which are named after a town in the Bohemia region of the Czech Republic. The Vintage Fine Ale and Suffolk Pale Ale became available as a limited edition in January 2018. They can be bought in select Tesco stores and Greene King pubs. Bottle of Greene King’s Vintage Fine Ale from its Heritage Series of beers. Find out more about the brewery and its beers, which include Old Speckled Hen and Abbot Ale, via the Greene King website. If you are interested in beer and real ales, you may enjoy taking a look at the CAMRA website. Take a look at the Visit Suffolk website to find out more about the county in which these ales originate. Illustrating photos are by Why Eye Photography. Why Eye Photography is based in the north-east of England and available for food and drink related photography commissions. Stuart Forster, the author of this post, can be commissioned to write food, drink and travel features. Disclosure: Bottles of the Heritage Series of ales were supplied in order to facilitate the writing of this post. Next Post Next Article: Accidents when you’re abroad – what should you do?